This illness is mentioned in my book “My Natural Cats” in detail and how Dr Gardner cured my cat of this. 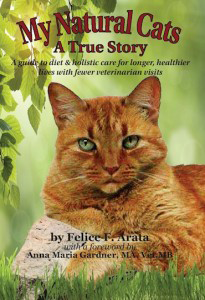 Treated holistically and with a raw diet you will extend the life of your cat. Dr Gardner prescribes to this disease with a thyroid supplement that worked for my Cat. Why Did My Cat Develop Hyperthyroidism ? Veterinarians did not notice that house cats were developing hyperthyroidism in numbers until after 1979. Curiously, that was about the time that whales and herring gulls in the St. Laurence Seaway, and cormorants in Tokyo Bay began developing similar thyroid problems. Both these areas are highly polluted with industrial chemicals. There are two chemicals that have been suspected as being the root of this problem. The most recent ones are called Polybrominated diphenyl ethers (PBDEs). Since the 1970s they have widely contaminated our environment. PBDEs are flame retardants used in building materials, electronics, furnishing, motor vehicles, airplanes, plastics, polyurethane foams and textiles. PBDEs are found in particularly high concentrations in fish that are high up the food chain and, therefore, in seafood-flavor cat foods. The second possible culprit is a chemical called bisphenol-A (BPA) which is used to coat the inside of cat food cans. We know from a 2000 EPA study that cats that eat canned foods – particularly those that have fish flavor, are more susceptible to hyperthyroidism. The authors theorized that it might be the BPA can lining that accounted for this – but at the time the article was written, we did not appreciate the link between fish, high PBDE levels and hyperthyroidism. It may be that, with time, pet foods will be screened for PBDEs and similar toxic substances. But for now, do not feed your cats canned or dry, fish-flavored cat foods. If you feed your cats fish, avoid fish like salmon and whitefish that are known to concentrate this chemical. Not all cats that develop hyperthyroidism eat fish products. The EPA veterinarians who conducted the study pointed out that PBDE’s have become so common in our homes that it is impossible to avoid some exposure to them.